At the core of the Challenger GS line are specially designed R-contact optics and Gen Super/CF-Super image intensifier tubes which provide edge-to-edge resolution performance unparalleled in a budget consumer night vision product. These devices are fitted with a five-lens eyepiece that minimises distortion at the edges of the field of view and increases sharpness and contrast of the image. The compact glass reinforced plastic housing ensures high durability and reliability. The Challenger range has an IP46 level of dust and water protection allowing it to be used in any level of precipitation. The Challenger is operated by a single switch which activates the device and the integrated IR illuminator sequentially. This prevents the IR illuminator from activating accidentally. This product is equipped with two diametrically positioned tripod sockets which allow attachment to an optional head mount for observation with the left or right eye or on a tripod. These sockets also enable a higher powered IR illuminator to be fitted. There are four models in the Challenger GS range that span four different specifications; the lowest magnification 1×20, the 2.7×50, the 3.5×50 and the highest magnification 4.5×60. 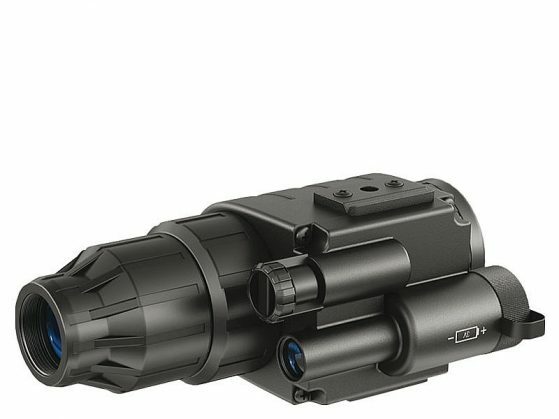 NEW NIGHT VISION AND OPTICS LISTINGS ON THIS SITE ARE FOR SALE but ALSO, GENERALLY, FOR ILLUSTRATION PURPOSES. GIVEN THE NUMBERS OF OPTIONS AVAILABLE FROM ONE SUPPLIER LET ALONE EVERY ONE IT IS IMPOSSIBLE TO ACTUALLY HOLD STOCK. (The manufacturer don’t do it. The importers don’t do it) As in independent retailer I certainly cannot do it for one company let alone for EVERY company I trade with. I will also 99.9% guarantee that if I have a particular version or model you will want a higher or lower spec. option. As with rifles. if I have a .223 Laminate, you will want a .308 Synthetic camouflage! Everything listed SHOULD be available and to the best of our knowledge is / was at the time of listing. However, things change on a regular basis as suppliers stop certain models / options etc. and introduce new. We WILL try to keep the site as up to date as possible but we are also trying to offer as many makes and options from a VAST choice…. This is as much to let people know, as easily as possible, what options there are as it is for advertising. Prices on new guns WILL ALWAYS BE SUBJECT TO CONFIRMATION WITH ORDER. They DO change, sometimes even in the customer’s favour if offers or deals are available from suppliers at the point of order. I will always strive to provide the best price to the customer that I can but I DO need to make a living! Delivery can be as little as 24 hours if in stock within the UK and orders placed early enough to allow dispatch the same day. They can also take several weeks to several months for certain guns. This will be discussed at the time with an estimate of expected delivery advised. ALL ITEMS LISTED (or their nearest equivalent) WILL BE AVAILABLE BUT MOST ARE TO ORDER WITH DEPOSIT OR PAYMENT IN FULL. THANK YOU FOR YOUR INTEREST AND UNDERSTANDING. All days are / can be flexible but please call first to make sure.